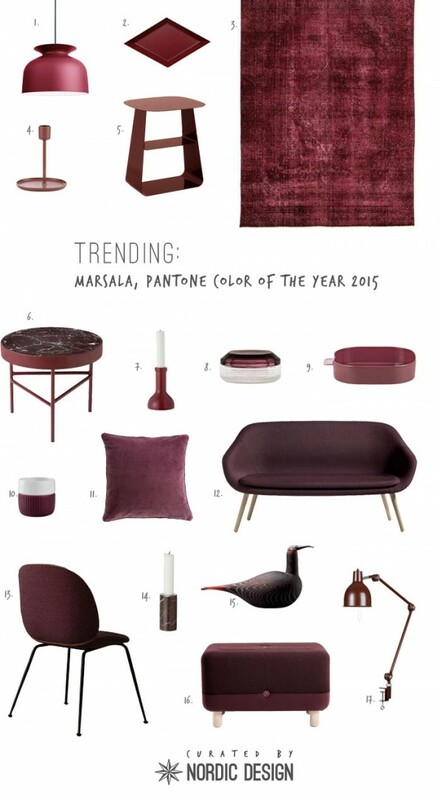 PANTONE announced that the 2015 Color of the year is Marsala, a deep, rich red color that takes its name from the fortified wine. Compared to last year’s bright Radiant Orchid, this dark, sophisticated hue definitely appeals to me. Just like my favourite hues of the moment, marine blue and dark green, Marsala is a stylish, warm and seductive. It’s a shade that combines well with whites, light greys and earthy tones. While I’m not ready to paint a full wall in this color, I’m looking into adding accent pieces that will complement my décor. Here are some of my favourite home accessories to bring this stylish hue into your home, all from Scandinavian brands and designers. Read more about Marsala color and pairings here. this is a very unique color palet, which i thought was a very weird and unsual design taste but it looks like it has really taken off this year and im am very excited to see this take off. Do you think it was because of all the Pomegranate craze last year that all of a sudden we have a color not too far off our favorite new fruit? Coincidence? I think not! I know they never ask my opinion but why can’t it be a bright, uplifting color?!? Ah well, next year I guess!